A contract is a written or verbal agreement between parties to be bound by the terms of the agreement. The contract is a legal, binding document that creates rights and obligations for all parties to the agreement. Breach of contract occurs when the terms of the agreement are not honored by one or more of the parties to the contract, either because they fail to fulfill their obligations or because they interfere with the other party’s ability to fulfill the contract. More information about breach of contract can be found on our Breach of Contract page. 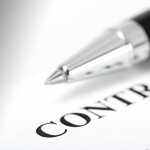 When should you get a Contract Attorney? Any time you are considering signing a contract for a substantial amount of money, or that requires you to perform substantial duties and obligations, it is advisable to have the contract prepared or reviewed by an experienced contract lawyer. The time and money you spend up front can protect you from serious losses down the road. There are many types of contracts, and you want to find an attorney who specializes in negotiating and drafting the type of contract you need. If you are buying or selling real estate, make sure that your lawyer has many years of experience drafting real property contracts in your state. If you are entering into employment contracts, you want a specialist in employment contract law. LegalHelpLawyers.com will put you in touch with the specialized contract attorney you need for your specific situation.